CAPDB is a system I created years ago to produce useful reports from CAPWATCH data that I couldn't get easily from eServices. It was later expanded to include things like unit alerting (as opposed to a calldown tree, say) and searching for and alerting qualified ES members for missions (find all UDF/GTM3 within 25 miles of a given lat/long, zip, or city & state and alert them). FLWG has been using it for years, and I have recently decided to open it up to other Wings after successful testing with other Wings. 1. 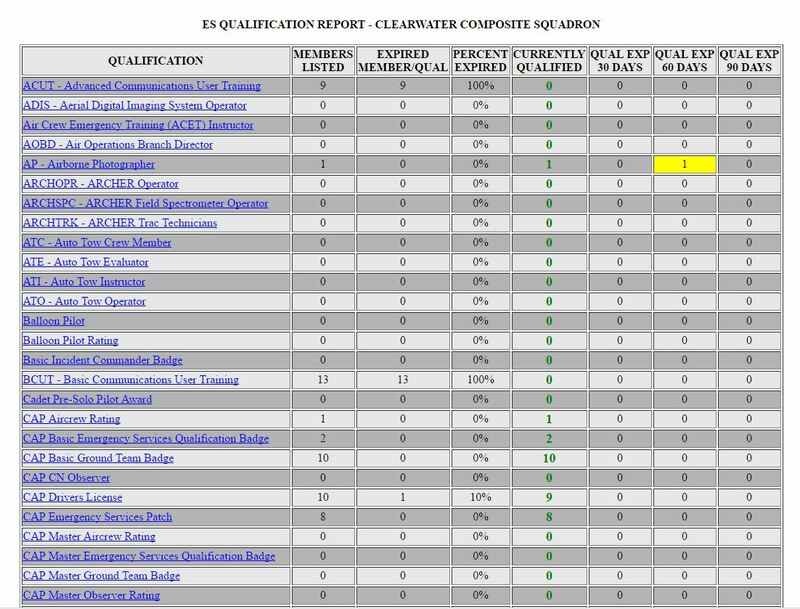 ES report - Lists all qualifications and how many members are qualified, expired, and will expire in the next 30/60/90 days. 2. Unit report - Lists all the organizational data for a unit including how many members (broken down into Cadets/Seniors) and all duty assignments. 3. Member List & Currency Report - Displays all unit members, their grade, expiration, safety currency, and their OPSEC, EO, and CPPT currency. Also provides totals on how many members need those courses. Allows for alerting all members as well. 4. Duty Assignment - Lists all members who hold a selected duty assignment. Great for Group level and above to find all Safety Officers, for example. 5. 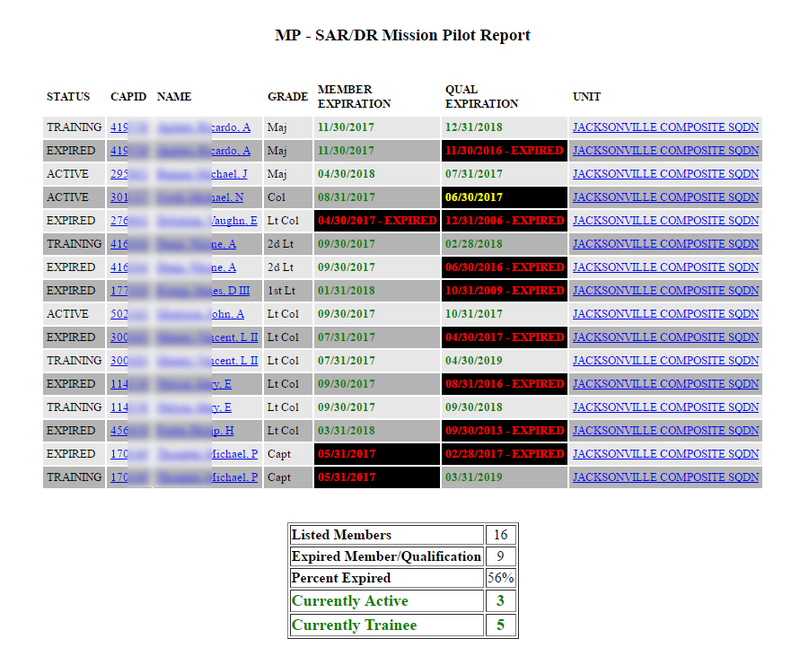 Qualification Report - Lists all members who hold a specific qualification - ES and pilot ratings, mainly. 6. Member Search - Essentially brings up an electronic member record with expiration info, contact info, lists of duty assignments, qualifications, and courses taken. 7. Commercial Privilege Pilot Report - Lists all members with either FAA COMM SEL or ATP SEL and who have both current medical and are TMP rated. 7. 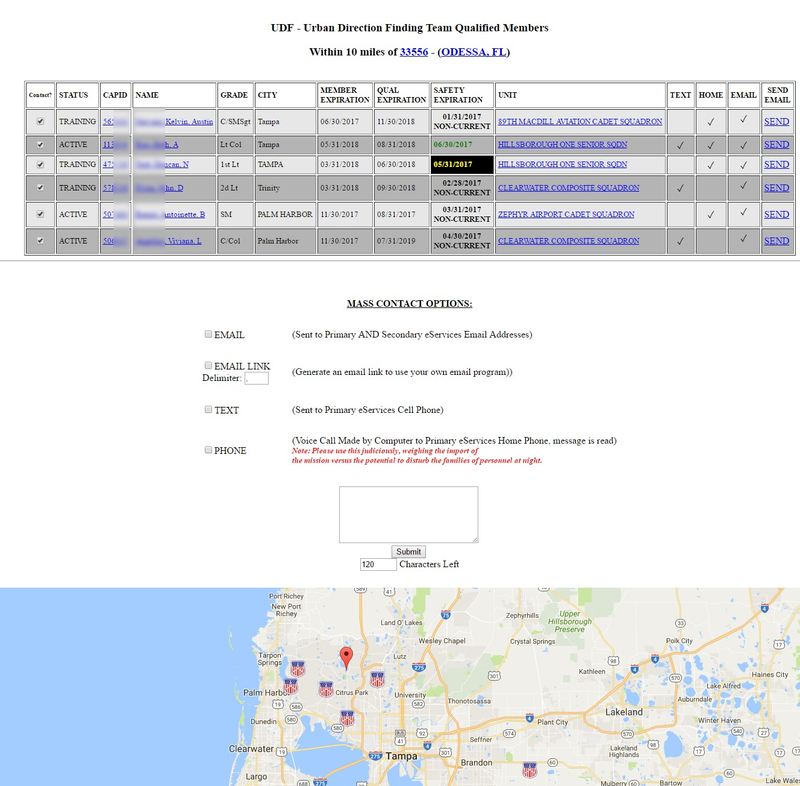 Qualification Search - Finds all members qualified in a given ES qualification (and some combos like all aircrew or all UDF) a given distance from a provided lat/long, zip, or city & state. Allows selective alerting and displays the member's home location on a map. 1. Email - sent to eServices Primary and Secondary email addresses. 2. Email list - generates a list to paste into your email program of choice. 4. Phone call - Robocall sent to eServices Primary home phone. You can select any combination of alerting options for a given alert. The main CAPDB system is designed to operate at the Wing level. It will require someone with Wing-level CAPWATCH access provide the CAPWATCH data to the system on a (pseudo) regular basis. Ideally, that person would be on the ES/OPS or Command staff, but that is not mandatory. That person should contact me either here or at joe@tomasone.com to arrange a WebEx demo and/or to get their Wing setup. Members in a given Wing are granted accounts and therefore login rights by the main POC for the Wing or a designee. The DUAT weather archive can be activated on request by any Wing staff member with whatever authority the Wing might require to make such a request. This system is offered free of charge to the CAP community, with all the warranties and tech support that "free" implies. Welp, with the NHQ/CC deciding that systems like CAPDB are verboten after 2 January 2018, it appears that this offer needs to be officially rescinded. I wonder if the directive from NHQ affects my WMIRS scraper (https://github.com/nharmon/wmirs_scraper). It would certainly seem to meet the definition of a "locally developed mission tool". I don't want to give false hope, but we recently had a SWR IT briefing with more info from NHQ and got an update on this initiative. My takeaway was this: If your local tool is used -In Addition To- WMIRS, and does not act as to prevent Mission/Operations data from being properly and promptly recorded in WMIRS, and it can work from the default CAPWATCH download, then it should still be OK.
Where they wanted to limit tools was those, such as CAPSTAR/CAPERS, that had folks doing things ONLY in the local tool, and not also in WMIRS. Again, I did not get a direct confirmation on the approved continued use of any particular tool (other than Arizona's eWing which was mentioned as OK), so please go up the chain and check. If you do get approval (or no shutdown notice) then we'd also like to look into this tool for LA Wing. My command has local applications that are using CAPWATCH data. We are not duplicating any eServices applications or capabilities. What should we be doing now to prepare for the change? If your unit is using CAPWATCH data, at your unit’s respective organization scope, to provide unique local IT functionality, then there is no immediate action required. You should continue to check with your IT Director and eServices news for updates and announcements. It is important to note that the data will not change for you. The process will change and NHQ IT will be communicating frequently on what to expect and when the new online process will be available. Does CAP intend to shut down all local applications? No, definitely not. CAP NHQ IT recognizes and values the IT innovation that is occurring in the field. Will we continue to have access to the CAPWATCH data either in its current format or in new format? have you submitted capdb.us as an internet operations application? Nope. Never even heard of doing so.